There were some heavy topics in this book. Domestic violence, envy, cheating, murder and a little boy keeping secrets. Revealing more and more of Archie’s home-life it was totally understandable that he started acting out at school. If not for his Aunt Allie, he wouldn’t have had a chance to a more normal life. His mother Louise wasn’t fit to be a mother and his adoptive father was a abuser, so what chance did that boy really have. How can a mother stand by and see her child getting more miserably by the day and do nothing. She even took that creep back, planing a new future with him, after everything he’d done. If not for the boy, I would have loved to see her in prison too. A good story, with emotional up and downs, a lot of heavy stuff happening - so be warned. Love K.L. Slater. And this book did not disappoint. The twists just kept coming. And the secrets were not what I imagined them to be at all. This book deserves high praise indeed. The Secret jumps right in with connected stories told from several points of view. At first glance, we hear from 8-year-old Archie and what he saw 18 months earlier. Not only was what he witnessed utterly tragic, but he is suddenly and viciously sworn to secrecy. What a terrible burden for such a young child to bear. We are then introduced to Alice, Archie's aunt and a near-recluse who has been scared to leave her home since the day her mother died. Lastly, we meet Louise, Archie's mother, someone that we begin to suspect almost from the very beginning. As it turns out, it is not just little Archie that is holding a secret. Others in this intriguing story have things to hide as well. The question as to how they are connected is definitely something quite mysterious. While the motherly part of me so wanted to see Archie relieved of his terrible burden, especially because of the toll it took on him, I was equally captivated with Alice's and Louise's past and present lives. I also connected with Alice on a visceral level. The relationship between Alice and Louise was strained, which is putting it mildly and was something that happened over the course of their entire lives. But, Louise is becoming increasingly difficult, and Alice does her best to try and help her, which would ultimately help Archie too. The secret that Alice has wasn't a complete one, but it certainly evolved, and she found having no one to trust with it. 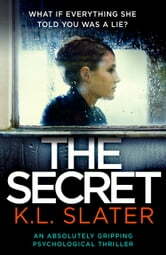 The Secret is a captivating story with so many turning points; too many to count, and is a book not to be missed. There are so many good things to say about this book; it was enthralling and incredibly difficult to put down. Even though life got in the way, I found myself stopping to grab my Kindle just to read a few pages more ... and would've easily read this in one sitting if it were indeed possible. This is a true psychological thriller, with a slow burn that builds into exceptional pacing and it truly caught me off guard. The dynamic between the characters captured my attention throughout. The conclusion was so riveting and chilling that you could have knocked me over with a feather. Many thanks to Bookouture and to NetGalley for this ARC to review in exchange for my honest opinion. The book i found was pretty slow in the plot and seemed had to go a while before evem the mystery or suspense started.was a good book but the plot and storline i found was slow. I usually try not to read reviews on a book that I’m about to read or have already started because I really don’t like to compare what others think about something I’m reading but when I finished The Secret I just had to take a little sneak. I have come to the conclusion that either something is wrong with me or I read a completely different book than everyone else because, I have to be honest here, I really just did not enjoy this book. I found the plot intriguing and the writing was exceptional but it just fell really flat for me and I felt like I was reading the script for one of those cheesy B rated thriller movies. You know… the ones where the call is coming from inside the house (Oooooh)? I don’t want to go on and on about what I didn’t like about this book. I found it very slow paced, there was a lot of POV switching that normally doesn’t bother me but I didn’t feel it was right here, there were a lot of flashbacks that answered some questions but they were just sort of random sometimes and came out of nowhere and I found I had absolutely no connections to the characters at all. The major annoyance I had though was the reasoning behind Alice’s reclusive life. THAT was something I had much higher hopes for and I felt cheated. I’m not saying that the reason was any less devastating than anything I could imagine but it wasn’t what I was expecting and it was like my balloon just popped. There was no coming back from that. I didn’t find the whole thing unenjoyable though. There were a lot of parts that really appealed to me. The teases throughout The Secret were very well done and threw me off at every turn. I had no idea what was coming at all and, although not exactly surprised, I didn’t guess the outcome and really didn’t see that twist. I also really liked the relationship and character development between Alice and Archie. I think that was beautifully done and such a powerful way to bring the characters out of their shells. I wish there would have been a lot more of that throughout the book. I always love seeing characters come into their own and it really helps bring a little something extra to the story. Even though I didn’t enjoy this book I still look forward to more books from K. L. Slater. This was my first book by the author but her books come so highly recommended that I will definitely be giving her another shot. I want to thank NetGalley and Bookouture for providing me with a copy of this book.